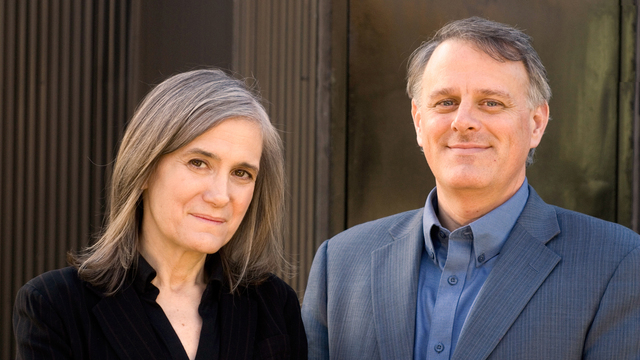 Amid Media Megamergers, A Mosaic of Community Media Thrives | Democracy Now! FLAGSTAFF, Ariz. — The business press is all atwitter with merger news, as federal regulators are set to approve a massive deal between cable giants Charter, Time Warner and Bright House Networks. The $78 billion transaction will create the second-largest cable TV/Internet company, dubbed “New Charter,” next to Comcast, and leave just three major cable providers in the U.S. Meanwhile, the Gannett Company, which owns more than 100 newspapers, including USA Today, is attempting to acquire Tribune Publishing, which owns several major newspapers, including the Los Angeles Times and the Chicago Tribune. On Feb. 19, 1996, “Democracy Now!” began as the only daily election show in public broadcasting. President Bill Clinton was running for re-election against Kansas Sen. Bob Dole and third-party candidate Ross Perot. The plan was for the show to run through Election Day. Our hope was that the issues in the presidential race were important enough and the audience cared enough that they would tune in to daily coverage that brought them voices and ideas not normally heard in the corporate media. That’s how we started: giving a voice to the grass roots. When the election wrapped up, we thought that “Democracy Now!” would wrap up as well. But there was more demand for the show after the elections than before. Why? There is a hunger for authentic voices — not the same handful of pundits circulating through all the media networks who know so little about so much, explaining the world to us and getting it so wrong. The show began on just nine community radio stations in 1996. Today, it’s carried on more than 1,400 outlets, a remarkable constellation of community media organizations: PBS, NPR and Pacifica public radio and television broadcasters, college and community stations, public-access television facilities, low-power FM radio stations, as well as online news organizations and, of course, the many newspapers that carry this column. These outlets each serve their community uniquely, providing relevant, locally created and curated content. As we travel, we see the connection that local media institutions help forge, both within a community but also across traditional barriers of race, class and age. Take, for example, the new low-power FM (LPFM) radio station that is being built in Albuquerque, New Mexico. LPFM is a noncommercial radio service that recently got a boost from the Federal Communications Commission after activists spent years pushing the federal government to allow more stations. This new station in Albuquerque is licensed to a long-standing media nonprofit called Quote…Unquote, which provides training in digital-media creation, to empower people to tell their own stories. This is just one of hundreds of innovative community media institutions that we are supporting as we travel the country. They are largely nonprofit, supported by enthusiastic volunteers, and are hyperlocal, beloved by the communities they serve. Even in this high-tech digital age, all we get is static: that veil of distortion, lies, misrepresentations and half-truths that obscure reality. We need the media to give us the dictionary definition of static: Criticism. Opposition. Unwanted interference. We need a media that covers power, not covers for power. We need a media that is the Fourth Estate, not for the state. And we need a media that covers the movements that create static and make history. That is the power of independent media. That is a media that will save us.